Cats love to hide in dark, hard-to-reach places where they feel safe and secure. Whether she is under stress or simply looking for a spot to nap, you may find your cat hiding under your bed, which fits the bill as a desirable spot to hang out. Cats sleep an average of between 13 and 18 hours each day, so they need to find a spot they consider both comfortable and secure for their frequent naps, according to the American Society for the Prevention of Cruelty to Animals. While sleeping, your cat feels most vulnerable. To get a worry-free rest, she will seek out the spot in your home she feels protected and is least likely to be disturbed, according to the Ohio State University College of Veterinary Medicine. The space under your bed is warm and hard to access by people and dogs, making it an ideal spot for a kitty snooze. Your cat may disappear there for hours at a time, sleeping peacefully. Whether it be a loud sound like thunder outdoors, a rambunctious dog or the presence of an unfamiliar visitor in your home, a variety of things can scare your cat. A scared feline will quickly head for an area she considers safe and secure. What better place than under the bed in a small space that other people or animals can't get to her? Once she feels that the threat has passed, your kitty is sure to pop out again, especially if tempted out with tasty treats. The relative safety of the area under the bed provides is also perfect for pregnant and nursing kitties. You may want to ask your veterinarian if your female cat might be expecting kittens if she is not spayed, recommends VetInfo. 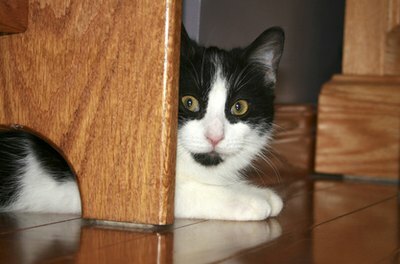 A cat affected by an illness or who is experiencing pain tends to hide away from people or other animals. Cats are private, somewhat solitary creatures by nature and this need to be alone increases when they feel unwell. Cats hide their illnesses from others because they make them seem weak and vulnerable to potential predators, according to Vetstreet. While modern house cats, especially indoor cats, no longer have to worry about being attacked by a predator in the wild, this instinct remains intact. If you notice that your cat is hiding under the bed more than usual, visit the vet to have her examined for a medical issue or possible injury. A change in your family situation, such as the birth of a new baby or addition of another cat or a dog to your household can cause your cat anxiety, as can a move to a new home or even a change in the arrangement of furniture in your home. These new situations can cause your cat to become anxious, prompting her to seek out a spot to hide away from all of what she considers overwhelming chaos. Your cat probably considers the relative isolation of the area under your bed as the perfect spot to get away from it all, at least for a little while. Alternately, a cat who is feeling depressed due to the loss of a favorite family member or pet may continually hide under the bed without coming out for long spans of time. If you notice your cat seems lethargic or is experiencing a loss of appetite, seek the help of your veterinarian to rule out physical problems. If your furbaby has been given a clean bill of health by a veterinarian, your cat may be feeling stressed, frightened or depressed if she hides under the bed much of the time, especially if she was a formerly social kitty. Make her feel better by spritzing a pheromone spray that contains calming chemicals under the bed and in any other of her favorite hiding spots. In serious cases, prescription anti-anxiety medications can also help ease your cat's stress, recommends VetInfo. Discuss your options with your veterinarian. PetPlace: Why Do Cats Like Small Places? Cat Channel: What Should I Do When My Cat Goes Into Hiding? Vetstreet: Why Does My Cat…Mask That He's in Pain?